I have an Event content type with a Date field with a start and end date. When this field is being displayed in a view, it displays properly, with the time matching the value that was entered. On a different page, I am overriding field--field-date.tpl.php and using date_create and date_format to print out the date and time separately. As you can see, it is displaying 4:00pm instead of 12:00pm. It looks like a timezone translation is happening (or not happening) somewhere. I tried to screw around with the time zone argument for date_create but nothing actually changed the way the date displayed. 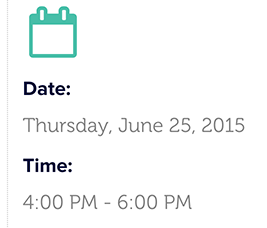 How do I actually display the proper timezone for my date with PHP in my field--field-date.tpl.php? Looks like your date field is configured to use either site zone or user time zone configuration. So, while saving the node drupal expects the entered value in usertime zone or site time zone and then convert it to UTC before saving it to database. While showing it views consider the timezone configuration and format the date as per current user viewing the date field. The timezone you see as 'America/NewYork' in the dpm result is the timezone configuration of the user created the node. In order to show the date with format you can use format_date, something like below. Important thing is to choose the right configuration for your field timezone settings, if the date field is irrespective to current user timezone keep the timezone configuration to UTC. How to show dates and times separately? 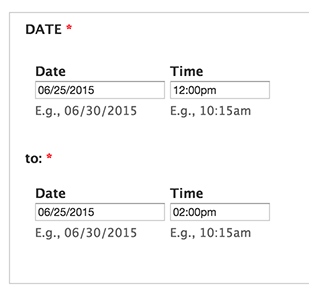 How do I get the timezone form reference on a date field? Why date field is picking the user's timezone? Date is wrong in storage but correct on display?